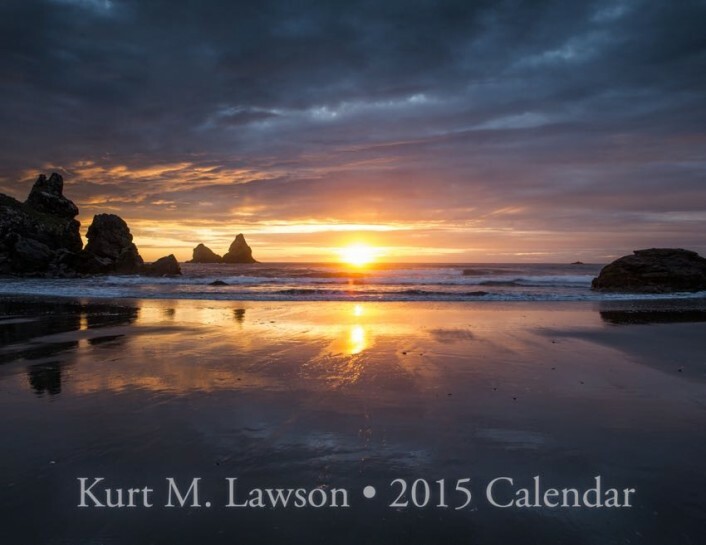 My 2015 Calendar is now available for pre-order! 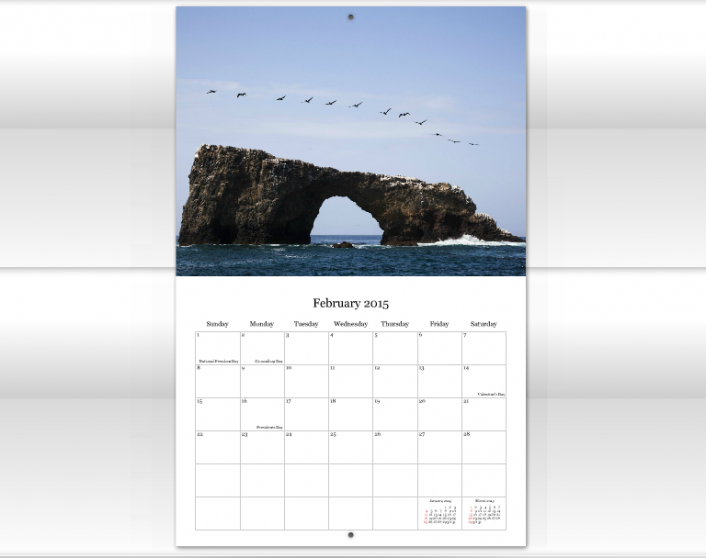 The calendar will be 8.5×11 inches with full bleed photos on the top half. As such the photos will be a little bit larger than last year’s calendar. I’m using a different printer this year that has been highly recommended by a few other photographers, so the quality all around should be really fantastic and better than last year. Price will be $25 including shipping. I’m paying the taxes too (if applicable). Click the button to pre-order. Pre-orders will help determine how many I print. I will get everything shipped out ahead of Christmas, so they can make great gifts! The Maroon Bells. You’ve probably seen them before. These two 14’ers in the Rocky Mountains in Colorado near Aspen are amongst the most photographed peaks in the world. In warm months hundreds of people visit the Maroon Creek valley and gaze upon these oddly colored pointy summits framed up by picturesque valleys of quaking aspens and evergreens, with all reflected in Maroon Lake which seems to have been put there just for that purpose. So many people visit the Maroon Bells in fact that during the summer and in weekends in the fall private car traffic is restricted here and you must take a shuttle bus from 9am to 5pm. The US Forest Service does this because there’s just not enough parking for all the people that wish to go there. 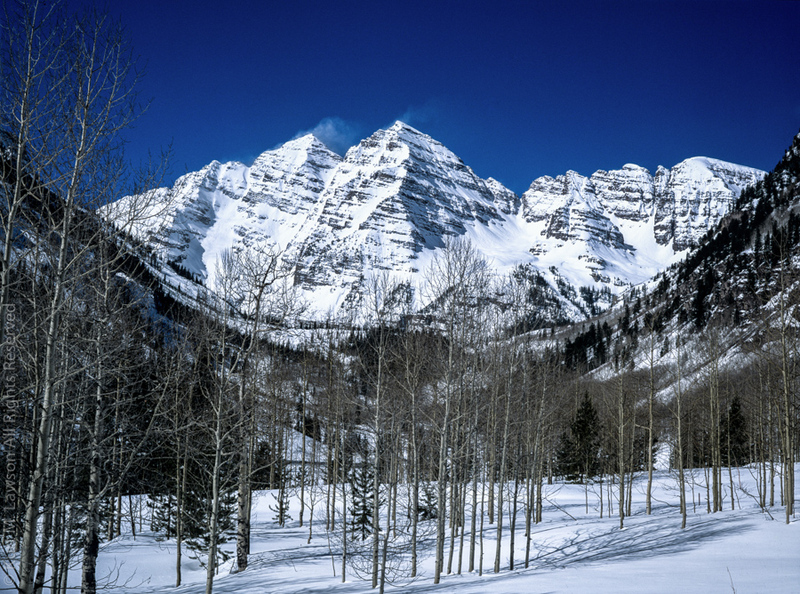 The White River National Forest manages the Maroon Bells Scenic Area, which is the gateway to the Maroon Bells – Snowmass Wilderness, which has excellent hiking and backpacking. For me the you could say the Maroon Bells are the epicenter of an origin story: the origins of my own photographic roots. 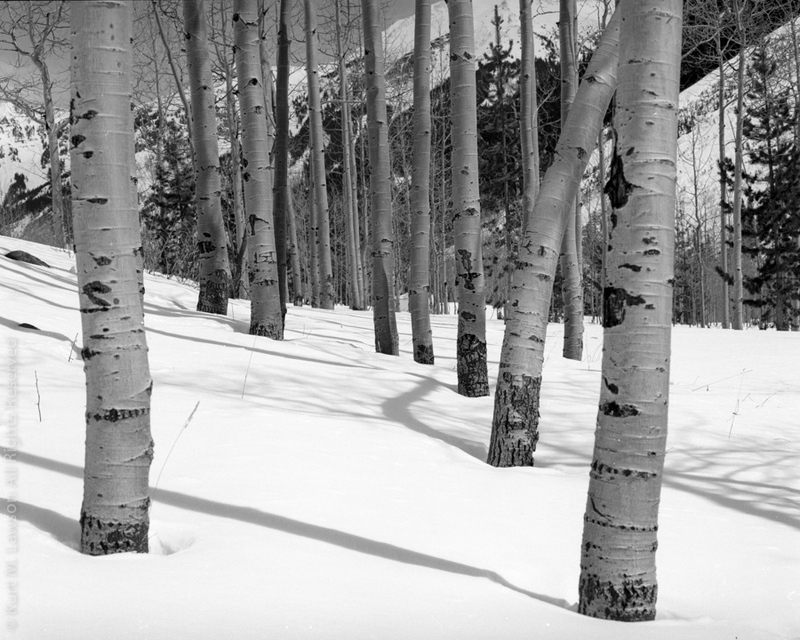 My family made a couple of family vacations to the Aspen Area when I was growing up. This is a place some 1300 miles away and terrain vastly different than the glacially flattened mountain-free land of the midwest. The last of these trips was in approximately 1989 or 1990. I was an energetic little 10 year old running around, and I had a little Vivitar point and shoot film camera in hand in this valley. Strangely, I don’t have much of a memory of the beautiful mountain peaks around. I was more interested in running around the meadows and exploring Maroon Creek’s clear waters. In my young wanderings, one photo seemed to catch the interest of my parents and others who later saw it. It was a photo of Maroon Creek flowing over its rocky bottom. Being so many years ago memories are a bit fuzzy, but I do recall the praise that I received for this shot, and you might say that in some sense lightning struck on that day and ignited a photographic spark in my mind that would grow and develop for the rest of my life. By 1995 I was in high school. Elmhurst High School in Fort Wayne had a photography class – a class I would take for all 4 years. My photography teacher, Don Goss, had previously taught a few other neighborhood photographers that you might have heard of – Peter and David Turnley. I had a great time with my photography class then and received a lot of encouragement from Mr. Goss and others as I really embraced photography. Somehow by 1995 I had managed to acquire a Mamiya 645 Super camera even. In high school I was already a bit obsessed with getting more resolution than 35mm film had to offer, ha! In spring of 1995, I traveled to Colorado with my Mom. 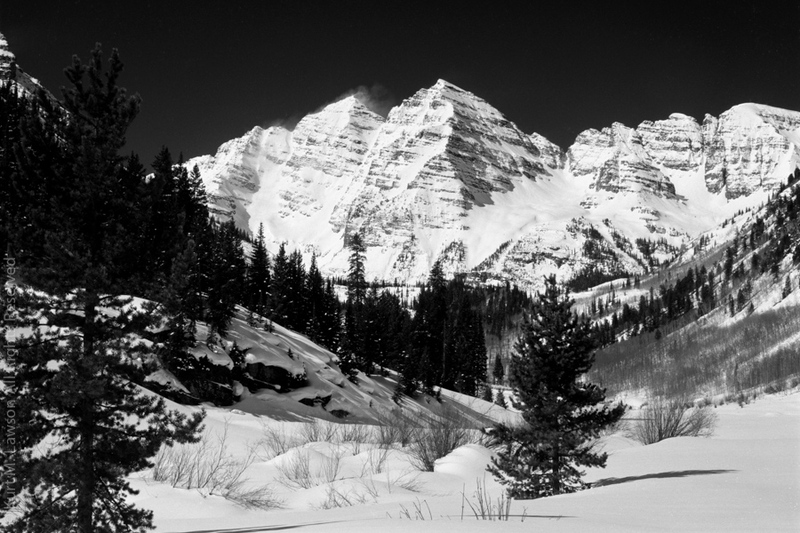 This would be my first return trip to the Maroon Bells with my own professional photographic equipment and my new found passion for photography. I had my Mamiya 645 Super and 80mm 2.8 Lens, and for the very first time rented two additional lenses for the occasion – the 210mm F4 and the 45mm 2.8. We rented these from somewhere in Denver and then made our way west to Aspen. This was early spring and snow was everywhere. 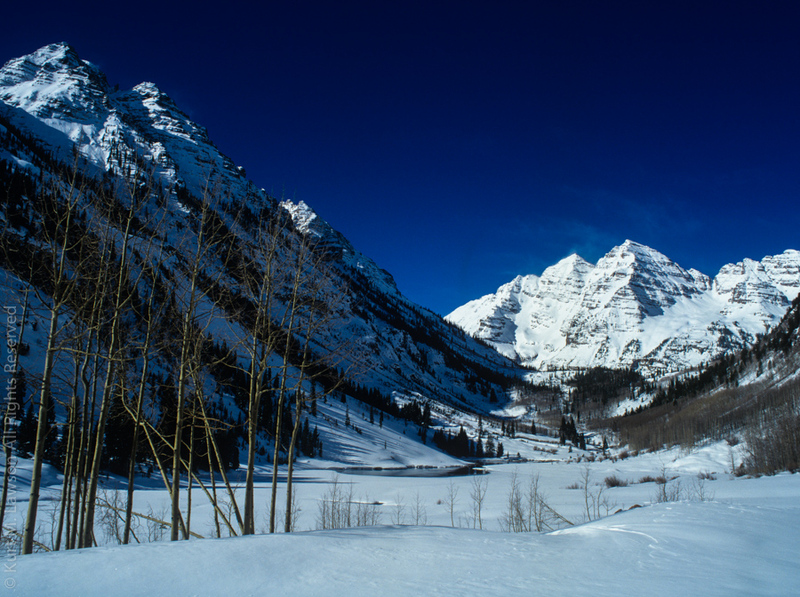 In fact, we discovered that the Maroon Bells had been closed for the winter due to avalanche danger, but we could check at the T-Lazy-7 Ranch to see about taking snowmobiles up there. We went to the Ranch, which is the end of where Maroon Creek Road is plowed of snow and learned that they had just checked the route and we could safely take snowmobiles up to the lake. So we suited up, rented machines, and headed up. They told us we were the first to do so that spring. For the entire time we were there it was just Mom and I and the silence of the snowy valley. It was very memorable. The Bells were gorgeous. I was captivated by them and also by the aspen trees. 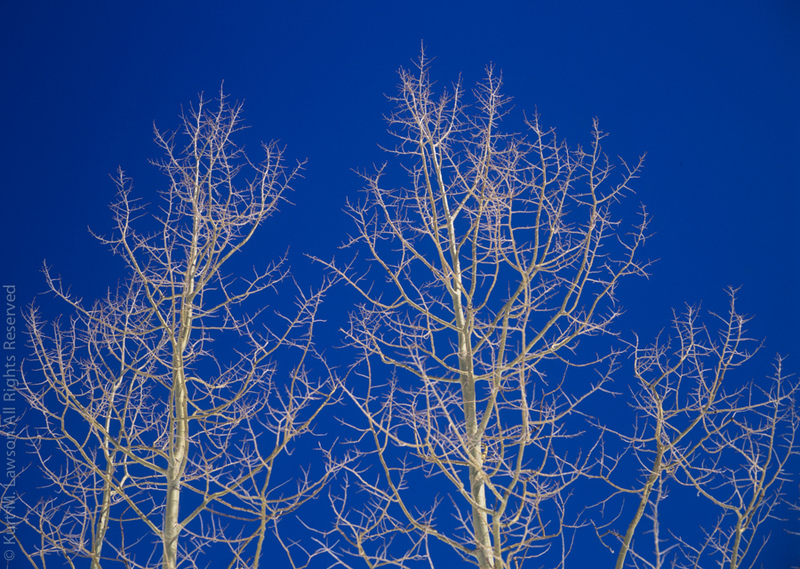 I loved photos I had seen of Aspen trees, and relished seeing them in person. I’ve always thought their bark had this seemingly magical way that the light seemed to wrap around their white trunks. When we were in Aspen we visited some art galleries. In at least one gallery there was the work of Christopher Burkett. This photo blew me away. The gallery had an enormous Cibachrome print and the golden trunks and white bark burned into my mind. A quest for my own similar shot would help fuel motivation for returning to Colorado in the fall years later. After spending the day by Maroon Lake in the valley of the Maroon Bells with just my Mom and myself, it was time to leave. I would not return for 19 years. Check out some more photos from this catalytic trip below. Fast forward to 2014 and after years of dreaming of a fall color trip to Colorado, I decided that the time was now and I made it happen at last. On my second day of travel from southern California, I arrived at my campsite in Maroon Valley in the dark. With clear skies forecast for the next few days, I didn’t make an effort to get up super early to try to capture the sort of iconic Maroon Bells fall shot that many photographers chase. I did not expect to capture a unique view of this location. Instead I would try to get that sort of iconic Maroon Bells shot for myself and enjoy the area, exploring for aspen groves and mountain views that these eyes had never seen. Armed with my twin 5D3’s, a Sony A7r and a Mamiya 7 II film camera I was prepared for anything. My Nissan Xterra Pro 4x would take me wherever I needed. The color was peaking in many areas when I arrived, and the sights and smells of fall saturated my mind. The way I figured, most photographers were chasing a sort of magic formula fall color sunrise shot at the Bells. You needed some snow to accent the peaks, no wind for a perfect reflection in the lake, peak fall color in the aspens and some clouds to capture dramatic color of the rising sun and add interest to the sky. In the photo above there is just one of those – peak color. To get a good spot at the lake, you had to arrive early. 5am early. By sunrise at 7am on one morning there were probably 100 other photographers along the lake, tripod to tripod. Did I mention at the beginning of this post that the Maroon Bells are possibly the most photographed peaks in North America? Generally most everyone was courteous to other photographers and it was nice to have some shop talk about photography as we all waited for the light. Some very nice photographers told me of other places to visit in the area and on this solitary trip it was great to have a little like-minded photographic company. All told I spent 4 mornings along the lake, watching the grand light show play out. Three of those mornings had zero clouds. The final day had perhaps too much clouds. The final morning I brought out the Mamiya 7 II to capture a film image of the Bells, connecting back to my trip with the Mamiya 645 19 years before. I pressed the shutter during a fleeing window of sunlight filtering through the stormy skies onto the ridge. The Fuji Provia 100 film provided a purplish rendering of the cloudy morning light. As I mentioned the trip was more than just about the Bells. I was after a Christpher Burkett inspired aspen grove. Each day I would explore new roads in the surrounding areas and discover a new stand of trees I felt was more amazing than the last. Here is a shot looking straight up in a grove just right along the Maroon Creek road. And another taken literally on the side of the road. My biggest surprise however I would not discover until after I returned home to California. After a few cloudless days at the Bells some weather rolled in around sunset. 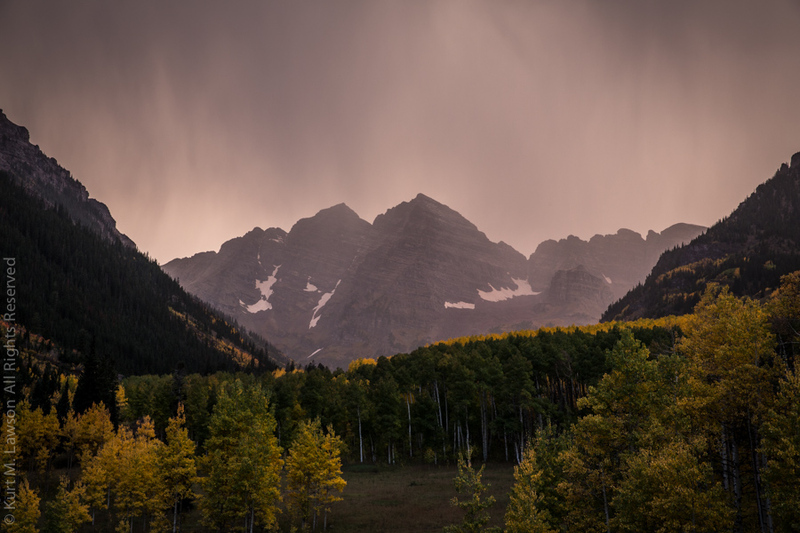 Although not famous for being a sunset location, I decided to hang out in Maroon Valley as a storm rolled in. I knew that eventually some weather would arrive during my trip and shortly after I arrived I thought that the only way I would capture a truly unique view of the Bells would be to capture lightning hitting them in a storm. This is a risky proposition for obvious reasons, and the weather in the mountains is hard to predict. Since last summer, I have owned a Lightning Trigger LT-IV. In my 9066 mile road trip last summer I managed to capture two shots that included bolts. I’ve done night time lightning shots before, but to capture daytime shots is really hard. That’s where the trigger comes in. Using an infrared sensor it will trigger the shutter as fast as possible. Because most bolts are actually multiple strikes along the same path, it gives you a chance (certainly no guarantee!) that you might capture something. You can really see how the lightning was backlighting the bands of rain. The sun had set by this time, so the light was fading but was still full of warm sunset colors scattered by the clouds. In fact, you can do something really cool when you have two shots like this. If you think about it, the lightning is adding to the scene. It’s a light source in the otherwise dark Maroon Bells scene. So, I can take the image with the lightning and the image without lightning and do something really cool with a compositing program like Photoshop. These images were both processed in Lightroom, which I use for 99% of anything I ever do with any of my photographs. You can read about my philosophy about compositing in photographs in this blog post from awhile back. Anyway, with Photoshop you can see just what exactly the difference is between lightning and no lightning by subtracting (blending mode) the non-lightning image from the lightning image. The result is actually really cool. You can see what is brighter in the lightning image vs the non-lightning image. Essentially, this is just the lightning and its influence in the scene. The darker image pixels RGB values are subtracted from the brighter lightning image so you just see the difference. To make it easier to see I used a Levels control to brighten the result, but it’s just something neat to see. 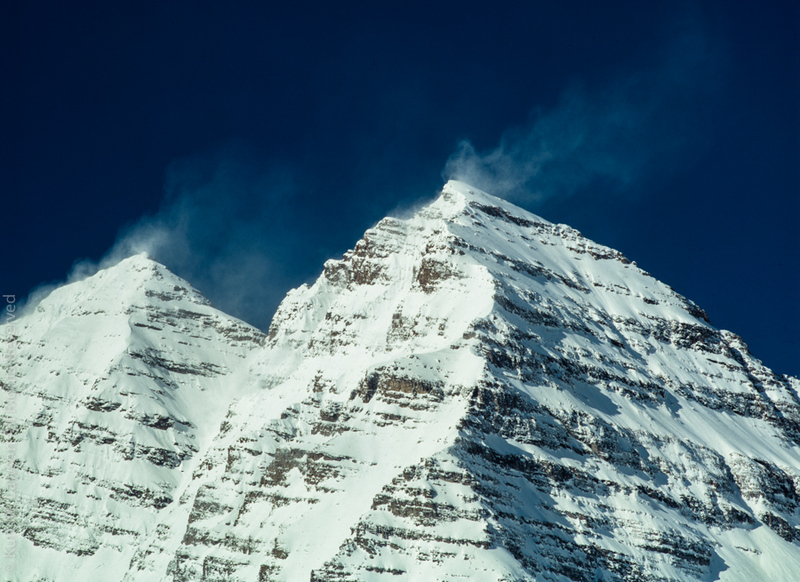 The bolt is striking just off of Maroon Peak. The left hand peak is the higher of the two, appearing shorter in frame due to perspective. Maroon Peak is 14,163 feet above sea level and North Maroon peak on the right is 14,019 feet. With that knowledge I’m guessing the bolt hit above the 14,000 ft line, just south of the summit. Here’s a 100% crop of the striking point stopped down. I sure wouldn’t want to be on the peak during a storm! I’ve been back for a few weeks now from Colorado and the state is still on my mind. What an amazing place! 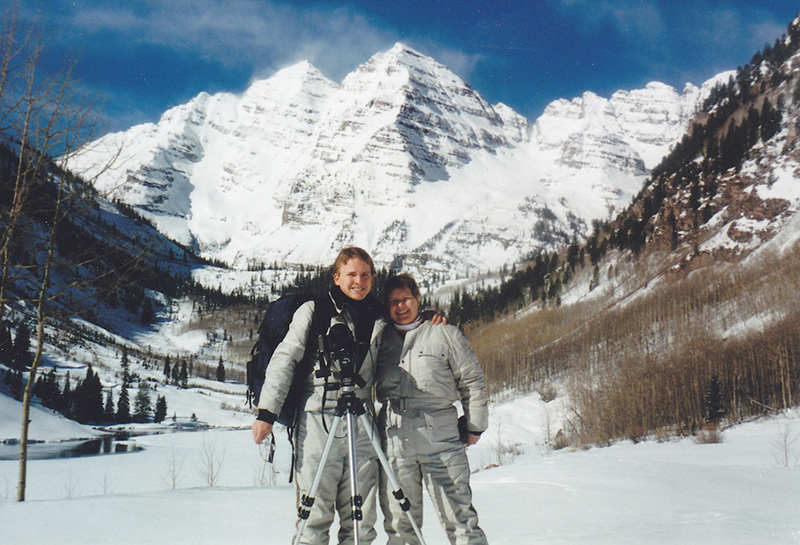 I can’t believe it had been 19 years since I had been back to the Maroon Bells. I promise the next time will not be 19 years from now! I can’t believe my luck in capturing the lightning strike on the Bells. I’ve done some Google searching and I have not yet found a photo by anyone else of a bolt striking those famous peaks, though I’m sure especially in the summertime it’s not a rare thing. Figuratively lightning struck me at the Maroon Bells all those years ago, providing a catalyst for my photographic exploration. On my return visit I literally captured lightning in my camera. I hope you’ve enjoyed reading my little photographic origin story. I have many, many more photos from the trip I’ll be posting in the coming days. Keep up with my most recent shots on flickr, 500px, Google+, or Facebook. A long writeup is in progress but in the mean time please enjoy these first couple of images from my journey with Sean Goebel, Matthew Saville Baldon, Wade Meade, and Cory Kobel to shoot the switchbacks again. This time we had 8 cameras in two locations and captured some amazing time lapse sequences of hikers tackling the 48 states’ tallest trail. Julie Calvo Fergus - WOW!!!! Incredible. Looking forward to the write up, however long it is. I loved reading the last one on the switchbacks. 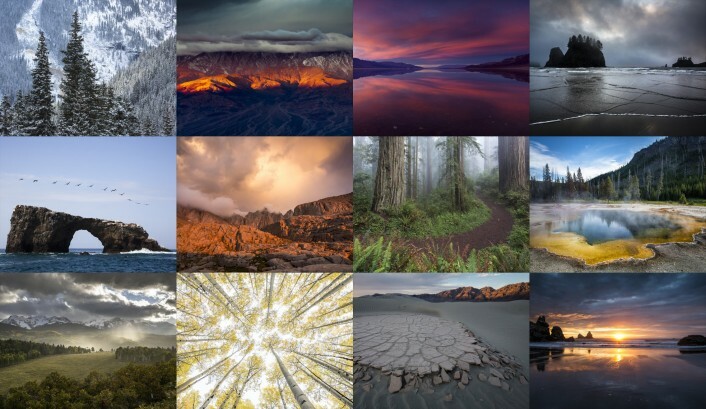 The last few years I’ve been doing a year-end favorites post showcasing a number of my best images from the year. I’ve done a variety of numbers. From now on I’m going to focus on 10 images, no matter how hard it is to choose. While I haven’t had a chance to write individual stories for each of the amazing places I visited this last year, you will find many of those images on flickr, 500px or google+.  Check out past favorites posts from 2010, 2011 and 2012. First up we have one of my favorite places in one of my favorite parks: the Eureka Dunes in Death Valley National Park. I always wanted to visit the area and never did in the days I was driving an old Toyota Corolla. Now I’ve been there several times with my Nissan Xterra and can’t wait to go back. I was able to squeeze in a quick trip in April to this place. Exploring around the massive dunes (which reach as far as 700 feet above the valley floor!) I came across this remnant of an ancient lake bed. What really took me by surprise was that it was pink! The color contrasted with the cool sands of the dunes and the magnificent layered Last Chance Range illuminated by the setting sun. After working like mad for the day job for much of the first part of the year, I embarked on a massive road trip. I needed a break, and I was eager to expand photographically outside of California. Expand I did, covering 9066 miles in 32 days. I’ll have more to say about this road trip in the coming weeks. The first destination was the Grand Canyon. I had never been to the Grand Canyon. I’ve seen thousands of photos and I’ve heard plenty of stories from people over the years, but I had never seen it for myself. This was destination one. And wow! What a canyon it is! I have seen lots of canyons over the years here in California but none of that really prepared me for the immense scale and awe inspiring landscape of the Grand Canyon. I highly recommend visiting at least once in your lifetime. This is my favorite image I took in the too short time I had at Grand Canyon National Park. This is sunset from a very popular spot – Hopi Point. The light was magical. A single cloud masked the sun and for a moment softened the light and brought out the warm, rich colors of the canyon walls. A few moments later direct sunlight cut back across the landscape and the soft warm colors were no longer so vibrant. The next major way point in my journey was a place I had learned about after seeing photos from other photographers at the Fred Miranda Landscape Forum. I am a fan of sand dunes. Ever since my first visit to Death Valley National Park in 2008, I have fallen in love with the intricate sand formed patterns and infinite shapes and sizes of these fascinating and dynamic piles of sand. Death Valley does not of course have a monopoly on sand dunes, and there is a whole national park named for them – Great Sand Dunes National Park in southeastern Colorado. My drive there from the Grand Canyon was long. I arrived in the total dark in pouring rain in the middle of black bear country. I couldn’t see anything. The next morning I awoke to find tremendous piles of sand, the largest in North America, in a clearing morning storm. The Eureka Dunes above reach 700 feet. The Great Sand Dunes reach 750 feet at the summit of Star Dune. These dunes are very different than the Death Valley sands. The sand has more of a brown-gold hue, with patches of black magnetite providing dark accents. Added to the mix was the fact that rain had just fallen and the winds were drying sand on the surface. All together, you get the great tonal variation seen here. I loved the texture of these dunes. The next National Park on my journey brought me to Badlands National Park in South Dakota. This is a park I always wanted to visit. I wasn’t sure what to expect, but after my short one night visit I definitely want to return and spend more time there. Here the flat emptiness in South Dakota is interrupted by “The Wall,” which is a formidable 100 mile long stretch of cliffs separating two levels of terrain. Exposed at the Wall are various erosion patterns and layers with grasslands above and below. One image in particular is a personal favorite. It plays tricks on my mind when I look at it, as the layers of sediments in the eroded landscape form near perfect horizontal lines that break the image up bottom to top in a way that makes me think of scanlines on an old analog television. The landscape was illuminated by a just rising sun. I definitely want to revisit this place soon and explore the land and the wildlife more. Next up was the number one destination for the road trip – Yellowstone National Park. This is another amazing place I had never had the chance to visit before. I booked 6 nights there and loved every second of it. Wow! Two images from this part of the trip are in the list. Neither of them are iconic places you will see time and time again. I think Grand Prismatic Spring is pretty much the coolest natural thing I’ve ever seen, and yet I don’t include a photo of it here. Instead first we have a rainbow and thunderstorm over the hot runoff from Terrace Spring. My first full day in the park featured scattered showers, and I recognized conditions were right for a rainbow. I was on the west side of the park and the sun was getting low. I was driving around looking for a spot looking East to frame up a potential rainbow shot. Not knowing much about places in the park I settled on the place I started the day at. Here at Terrace Spring the hot runoff heads away from the road with a few trees nearby and the lush Yellowstone wilderness beyond. I set up and waited. A group of tourists came over and asked me what I was shooting. I told them a rainbow would appear and they kinda laughed and started walking off. No sooner had they started to walk off than the rainbow appeared. I yelled to them to look and then they smiled and laughed. This has remained a personal Yellowstone favorite for me. The second image from Yellowstone that I have chosen is one of simple symmetry. I’ve been a fan of water-reflected symmetry ever since my visits to a flooded Badwater Basin in 2011. I came across this scene wile exploring the edges of Yellowstone Lake. I just loved the simple symmetrical composition of the lodgepole pines, grasses and water. Light rippling in the water provides a little breakup to the reflection surface. I just find it very pleasing to the eye and thus is edged out photos of all sorts of Yellowstone icons to claim a spot in my favorites list. One of my days in Yellowstone was set aside for a trip down south to the neighboring park below – Grand Teton National Park. My first thought of this park usually is of an iconic image from Ansel Adams at the Snake River Overlook. I found this to be another superlative park. The sudden rise of the Teton Range over the Jackson Hole valley is dramatic and awe inspiring. As it turns out, I picked an interesting day to explore the park. I stopped at an overlook area and watched as an incoming storm passed over the Tetons heading right towards me. With my new lightning trigger I was able to get a little cloud-to-cloud bolt just before I headed to safer ground (also just before horizontal rain started!). The storm was dramatic and beautiful. Living in southern California I really do miss storms. One day was nowhere near enough time for this amazing park. I will be back. This stormy scene is my favorite from my time in Grand Teton National Park. The next National Park on the journey was Olympic National Park. I had visited this park very briefly about 10 years before. I had seen the beaches and mountains but not the rainforest. I was most excited for the beach and for the rainforest. As it turns out, the rainforest can be dry in the summer. And with the dryness the light can be harsh. I was not terribly pleased with the photos I was able to take in the forest. Cloudless skies dominated above, so we headed to the beach first. Second Beach was a really neat place with large rocks offshore covered in trees. At the coast, a thick marine layer hugged the shoreline in stark contrast with the blazing sunshine just 1/2 a mile inland. Defiantly we stayed at the beach through sunset hoping for a break in the clouds. Fortunately a slight break occurred. The tide was out but was just starting to come back in. Waves wrapped around the stacks and collided in opposite directions, forming neat patterns in the wave surface. The Redwoods. I love trees. In particular, Redwoods will always have a place in my heart whether they are the tall graceful giant coastal redwoods or the thick, red, massive giant sequoias in the Sierras. In the past I have seen other photographers’ photos of shafts of light in fog in forests. I had always wanted to see such a sight myself, but never had the opportunity. When I arrived for my two night stay in the Redwood National and State Parks area in northwest California, I spotted a scene that was everything I had been wanting to see and then some. Along the coast a marine layer of low clouds was yielding overcast conditions. I drove around to get my bearings in the park and then discovered that the road went right up into the clouds. Near the top, I suddenly was aware of all the beams of the sunlight filtering in from the high canopy above. I pulled over and went to work and watched in awe as the light moved through the trees. The fog revealed each shaft of light spreading out in every direction from the Sun. The scene was magical, and I felt as though I had been transported back in time to a prehistoric era. Not since “Wow” had I felt compelled to vocally say “Thank You” aloud to Nature around me for sharing such a quality experience with me. If forced to choose one picture from 2013 as my “best of”, this is it. Finally, if you follow my various photography postings around the web, you might occasionally come across a train photo or two. I have since I was a kid been completely fascinated by steam locomotives. This fall I had a chance to take a photo under beautiful lighting conditions. The sun was setting and the Fort Wayne Railroad Historical Society‘s 765 here was steaming home after a series of excursions to the east. Pacing along side the locomotive on the roadway, suddenly the steam engine started emitting picturesque black smoke. We later learned the black smoke was by request of Norfolk Southern, the railroad that owns the tracks here. Normally, a fireman will run an efficient fire which produces little to no smoke. Photographers like me will often wish that the fireman was wasting a little fuel in order to give us some picturesque black smoke. With the setting sun, it was magical. You can see some video I shot while chasing the train here. So there you have it. After much agonizing over how to narrow down 50,037 photos to just 10, this is what I came up with today. Tomorrow I might change my mind, but I’m going to stick with it. I look forward to many new adventures in 2014. I really enjoyed breaking photographically out of California. It has really ignited a desire to arrange photography trips much further away. Hopefully my day job will afford me new opportunities to travel this year. Also, I have a new years resolution to make the time to write more in this blog to go along with some big changes I have planned for the rest of my web site. Happy New Year! Simon Holden - Great work, Kurt! Jimmy Denham - Nice work!